One of the best experiences I had during my 7 day trip to Moab. The guides were a ton of fun (Daniel, Ryan, and Josh) and were very knowledgable. I felt totally safe the entire time. What an experience it was to float along the Colorado River on a SUP! Loved it! - Toby D.
Megan was our guide for our stand up paddle board trip in Moab. She was very personable and did an awesome job guiding us down river for the afternoon. This was a first time Stand up paddle board experience for the four of us and we all had an amazing time. We even got into a few yoga poses and did some planks and push ups on the boards as we went down river. 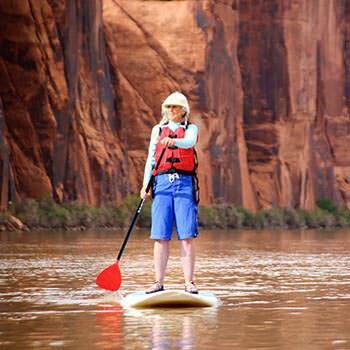 we highly recommend the Moab Adventure Center and Megan for a Stand up paddle board experience that you will totally enjoy. We will definitely be back again for another excellent adventure. Thanks!!! We had a great experience on the Stand Up Paddle Board Adventure and we loved our guides, Chris and Buck were awesome! Thanks for an enjoyable experience! Wonderful experience. As a family we went paddle boarding on the Colorado River. We are beginners. Aimee and Meghan were our guides. They were friendly, helpful and very knowledgeable - especially when you fell Into the River - and you will fall. Loved this experience and would highly recommend to anyone. From beginning to end everyone was very friendly and helpful.